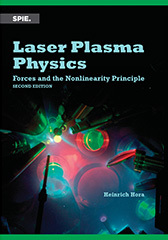 This book is an important reference work for the field of high-intensity and high-plasma-density laser–plasma interaction. It summarizes past advances and opens insights into the future. The book covers the essentials from a single particle to dense fluids, and from computational physics to applications for fusion energy or hadron cancer therapy. In addition, it contains clear explanations of the theory of electrodynamics, laser-driven hydrodynamics, Maxwell’s stress tensor and Lorentz force, complex refractive index, and relativistic effects in plasmas. Beyond these classical aspects, the book indicates where quantum and classical theory converge. Topics new to this edition include: an introduction to the ponderomotive potential and an overview of related phenomena, including hydrodynamic derivation of nonlinear forces; Richard Feynman and the nonlinearity principle; application of ultrahigh plasma block acceleration for electrons above GeV energy; extremely dense ion blocks for non-thermal picosecond ignition of fusion; and the very first approach to economical power generation using boron fusion with complete exclusion of nuclear radiation problems.